Five More Local Entries Won Merit, Excellence, and Distinguished Awards! 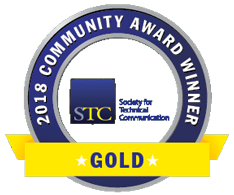 We are proud to announce that the STC Office let us know that five more winning entries from our local competition won awards at STC's International Summit Awards (ISA). To see our two other winners announced earlier, please see the list at Our Local Competition Winners Win International Summit Competition Awards. 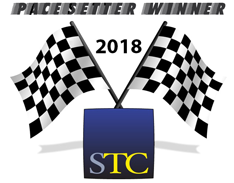 The The Pocket Paper Engineer, How to Make Pop-Ups Step-by-Step Volume 3 entry, submitted by Popular Kinetics, received an Award of Distinction in the 2014 STC International Summit Awards (ISA) competition. The entry won an Award of Distinction in the local Washington, DC-Baltimore Chapter competition earlier this year. The entry was submitted by Carol Barton. Contributors were Carol Barton and Eleni Smitham. 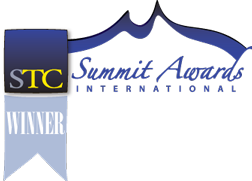 The U.S.-China Clean Energy Research Center Annual Report 2012-2013 entry, submitted by Energetics Incorporated, received an Award of Excellence in the 2014 STC International Summit Awards (ISA) competition. The entry won an Award of Excellence in the local Washington, DC-Baltimore Chapter competition earlier this year. The entry was submitted by Julie Chappell. Contributors were Matt Antes, Julie Chappell, Dylan Waugh, Namrata Rastogi, Robert Marlay, U.S. DOE, Gareth Williams, Valerie Riedel; Alex McLean, U.S. DOE; Lindsay Brumbelow, U.S. DOE; Burt Koske, Idaho National Laboratory. The Electric Grid Reliability and Resilience: Lessons Learned from Superstorm Sandy and Other Extreme Events entry, submitted by Energetics Incorporated, received an Award of Merit in the 2014 STC International Summit Awards (ISA) competition. The entry won an Award of Excellence in the local Washington, DC-Baltimore Chapter competition earlier this year. The entry was submitted by Julie Chappell. Contributors were Katie Jereza; Gareth Williams; Tommy Finamore; Ladeene Freimuth, GridWise Alliance; Becky Harrison, GridWise Alliance; Lee Coogan, GridWise Alliance; Allan Schurr, GridWise Alliance; Pam Thornton. The Opower Online Help for Utility Customer Support Staff entry, submitted by Opower, received an Award of Merit in the 2014 STC International Summit Awards (ISA) competition. The entry won an Award of Excellence in the local Washington, DC-Baltimore Chapter competition earlier this year. The entry was submitted by Richard Rabil, Jr. The contributor was Rebecca Glassman. The Public-Private Roundtables at the Fourth Clean Energy Ministerial entry, submitted by Energetics Incorporated, received an Award of Merit in the 2014 STC International Summit Awards (ISA) competition. The entry won an Award of Excellence in the local Washington, DC-Baltimore Chapter competition earlier this year. The entry was submitted by Julie Chappell. Contributors Dylan Waugh, Tracey Crowe, U.S. DOE, Julie Chappell, Valerie Riedel, Matt Antes, Kavita Ravi, U.S. DOE, Christie Ulman, U.S.DOE; Matthew Wittenstein, U.S. DOE; Paul Telleen, U.S. DOE; Graziella Siciliano, U.S. DOE; Graham Pugh, U.S. DOE.